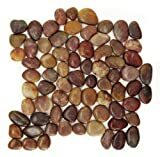 Polished Pebble Tile - Rustic Red 12x12"
All normal polished pebble tiles are the perfect selection for bathroom, kitchen, backsplash, pool, spa, and floor tiles. They add a sense of beauty, luxury, and elegance to any indoor or outdoor application. Each and every stone is meticulously sorted by hand according to its dimension, colour, and shape. Then, they are attached to a web mesh by pollution-totally free glue. Normal polished pebbles are a quite popular option for shower splash and floor tiles. Price tag is per piece each and every piece weight - four lbs. Please note: Pebbles are a organic solution so variations in colour and texture are to be anticipated. All tiles need to be inspected ahead of installation, as no adjustment will be produced following set up. Disclaimer: Pebbles are a natural product so variations in color and texture are to be expected. All tiles should be inspected before installation, as no adjustment will be made after installation. Interlocking Tile 12" x 12"